Just realised on reviewing this again, our old invoice for Coke & Coal that the etching depicts the Hare pub, which is still there hardly changed to this day on the corner of Cambridge Heath Road and Hare Row… right next to the main entrance to the the then Gas Light & Coke Company yard in Bethnal Green. The large Gasometer is on the site today and so is the industrial site around The Oval and the Regents Canal… which was once just a small ebbing stream which flowed across the heath filing ponds on its winding route. 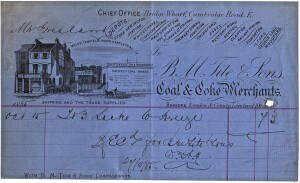 The Gas Light & Coke Co. was obviously built upon the original but long since gone Cambridge Heath. Once it would have looked very much like Hampstead Heath does today, although flatter. The Heath and lands all around the area were once owned by Bishop Bonner “Archbishop of London”, who resided on the heath in a Elizabethan Hall / Jacobean Bishops Palace.